Utah has succeeded in attracting another action sports event. The first time event is one of nine Nationals on the 2009-2010 schedule. It will be an all day event with the Main Event starting at 7:00 p.m. MT Jan 9, 2010. The Main event will consist of pro and semi-pro racing in a snocross format along with some freestyle events from the days qualifiers. Snocross, as the name implies, is basically a supercross with snowmobiles instead of dirt bikes. The sleds race through tight turns, berms, bumps and jumps in a tight stadium course. The freestyle events consist of high jumps and tricks very similar to freestyle motocross. Snowmobiles have recently added such tricks as the backflip which can seem even more tenuous on a 500 pound sled than a 250 pound bike. 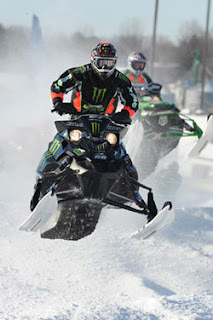 One of the top names in snocross is Tucker Hibbert. In the events that we have watched, he was able to dominate most races, winning 8 snocross medals at X-games including 3 golds. He is scheduled to race at the Utah stop along with many other pro riders. Races such as this allow spectators to see a race in person. The stop in Utah will be the only stop west of the Mississippi, so it's a great opportunity for those wanting to see it. The schedule for the 2009‐2010 AMSOIL Championship Snocross Series is below. New National events for this season are noted by an asterisk (*). Tickets for the event are available at RioTintoStadium.com and range from $15 to $55. Looks awesome! Are you going to that? I'm not sure yet, it's a bit pricey. I think it looks fun though. They have some local snowmobile stuff every year at Fairview fairgrounds, I think a snocross(local kind) and jumps and stuff. Then they have other snowmobile events at the canyon. I will let you know about it when I hear about it. Found it: http://sanpete.com/events#event123 doesn't look that exciting compared to the one your talking about in this post though. 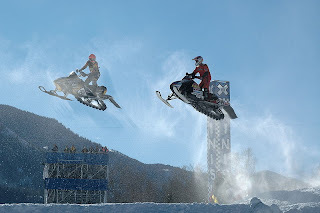 Snocross looks like seriously awesome fun! Wintersports such as this is not something we get much of in my neck of the woods, but I would really love to do an excursion to a place where I can get to do some Snocross. I love riding, and my current bike is a Husky SM610 motard. Great fun in town and the tight twisties.